APEX – Apex, Holly Springs and Fairview firefighters responded to a one-story dwelling fire Thursday evening, March 13, 2014. JACKSONVILLE – A retired New River Marine lost both his home and his dog in a Jacksonville fire. The fire happened at about 6:30 p.m. Tuesday in the Aragona Village neighborhood of Jacksonville, at the corner of Jasmine Lane and Sycamore Drive. 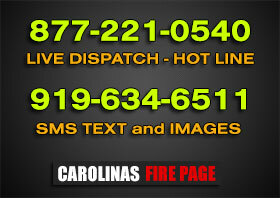 RALEIGH – Raleigh firefighters responded to this one-story dwelling fire on February 24, 2014. BLACK MOUNTAIN – The Black Mountain Fire Department responded to a fire involving three homes and the surrounding woods, Deputy Chief Craig Bannerman said. Gaston Volunteer Fire Chief Ed Porter Jr. said around 4:38 a.m. Monday fire units from his department, as well as the Garysburg Volunteer Fire Department were dispatched to a home on Bay Street in Gaston in response to a fire. The Clyde Fire Department held its annual 9/11 memorial service at 6 p.m., Wednesday, Sept. 11 in front of the fire station located at 8531 Carolina Blvd. in Clyde. Cove Creek VFD firefighters from Station 22 were dispatched to a vehicle fire on Watauga River Road off of Highway 194 around 09:15 hours on Wednesday, September 4th. Level Cross Volunteer Fire Department Engine 431 carries the casket of former Fire Chief, John Hussey, from Pugh Funeral Home to Randolph Memorial Park in Asheboro Saturday. The Fletcher Police Department is still investigating the two-car collision at 80 L.A. White Drive, which led to the death of 50-year-old Ervin Lee Gregg of Weaverville.